I thought I'd amuse you all with this little piece of history, the first in a series, as I recently realized it's all-but-gone from the web, thanks to the originating site Comixfan apparently having disappeared recently. (It returned, but the archives are gone.) I rescued this little gem from my cache so you can marvel at it--it's probably the first lengthy interview with current Incredible Hulk scribe Greg Pak back when he'd just been announced as writer of the series with issue #92. That means this is a big talk about "Planet Hulk," with the mega-epic World War Hulk still over a year away. It was conducted in late 2005 via e-mail, and originally posted at Comixfan on January 3, 2006 under the somewhat hammy title of "Gamma Gamma Hey! Greg Pak Talks 'Planet Hulk'!" Forgive the liberal allusion to Dan Slott's She-Hulk series and enjoy! It's particularly apt to see Pak's comments in the beginning, since as recently reported, we're staring out at the end of his tenure. At San Diego Comic-Con International 2004, whilst promoting the then-upcoming Warlock limited series, Marvel Comics Editor-in-Chief Joe Quesada labeled maverick indie filmmaker Greg Pak "the best writer you've never heard of." Four of Pak's projects were all excellent, he said, but never saw the light of day for one reason or another. However, since Warlock and Greg's subsequent miniseries, X-Men: Phoenix - Endsong became critics' darlings, he's been on a roll with some even more notable Marvel projects, such as Iron Man's entry into the House of M and the follow-up to Neil Gaiman's Marvel 1602. Finally, in October 2005, Quesada named Pak as one of the "Ten Terrific," a group of writers the editor claimed would be getting a big push from Marvel and one super new project apiece to catapult them into the medium's forefront. Comixfan: The Incredible Hulk marks your first gig on a regular Marvel title, and it's a pretty high-profile gig at that, coming hot on the heels of writer Peter David's second run on the book and the four-parter by Daniel Way. How did you come to land the job? Greg Pak: I was lucky enough to get paired with editor Mark Paniccia on the Marvel Nemesis miniseries. Mark eventually became the editor of [The Incredible] Hulk, and since I'd brought up the Hulk a ridiculous number of times in conversations with him, he must have gotten the hint that I was interested in the character. Comixfan: What's your exposure to the Hulk? Pak: I’ve loved the character for years. In particular, I remember the origin story and the Namor fight in the Origins of Marvel Comics anthology [reprints of The Incredible Hulk #1 and The Incredible Hulk #118 respectively] making a big impression on me as a kid. And while it’s very different from what we’re doing with the character in "Planet Hulk," I loved the Bill Bixby television show--I credit it as my introduction to the literary concept of tragedy. I’ve been lucky enough to work with the Hulk already at Marvel--in the Marvel 1602: New World series and as a special guest star in the "Mastermind Excello" story from the Amazing Fantasy #15 anthology comic. Comixfan: The Hulk has been different things at different times: smart, stupid, and somewhere in the middle; gray and green; strangely simpatico with Banner, and fiercely antagonistic. For those who haven't followed the character in a while, what's the state of the Hulk these days? Pak: We're carrying on with Peter David's version of the Hulk from the end of his last run--big and fierce but neither fool nor child. Crafty, mean, and green. It's a great version of the Hulk to work with--he's smart enough to be in charge of his own decisions and destiny, but savage enough to raise the question of whether he'll ultimately become a villain or a hero. Comixfan: In your own words, who are Bruce Banner and the Hulk? Do you see them as two sides of the same coin, or almost totally different characters trapped in one body? Pak: From a storytelling point of view, I think it's most fruitful to think of Banner and the Hulk as different aspects of the same person. The great thing about the character is that Banner and Hulk can be interpreted any number of ways, depending on the story and the reader. Typically, Banner's seen as the hero and the Hulk as the monster he has to suppress. But I'm intrigued by the notion that the Hulk may embody certain virtues that Banner can't or won’t express on his own. That's the angle we took in Marvel 1602: New World, in which Banner is essentially a villain and the Hulk is the manifestation of his conscience and true human potential. Whichever way you choose to interpret Banner and the Hulk, the dual nature of the character provides a great way for a character's inner struggle to be depicted visually, dramatically, and compellingly. Comixfan: What's the fundamental appeal of the character(s), both personally and, as you perceive, in fans' minds? How has the Hulk survived for over forty years? Pak: On the one hand, the Hulk takes the wish fulfillment aspect of superhero stories to the absolute extreme--Banner's a skinny nerd who can become the strongest human being on the planet. That's a powerful fantasy for kids--and I think it's why young kids in particular, who have so little power of their own, can really love the Hulk. But wish fulfillment alone wouldn't provide the character with the staying power he's had. The fact that the Hulk can never belong, can never truly find a place in the world, makes him an enormously sympathetic and compelling character, while the fact that he's always on the verge of explosion, of losing control, raises deeper questions of how a rational human being should deal with an irrational and unjust world. Those are great themes for multidimensional, emotionally compelling storytelling. Comixfan: I've heard many suggest the Hulk is an extraordinarily difficult character to write. Do you agree or disagree, and why? Pak: When writing any established comic book character, it’s a huge challenge to be true to a character's distinctive voice while avoiding the cliché of just repeating the character’s various catchphrases and tropes. For me, the solution is usually to figure out the character's real emotional story — then the character comes to life and what could be cliché has the chance to become a resonant reflection of the character's struggles and journey. When it comes to the Hulk, there's a particular challenge because he's so often associated with caveman syntax, or at the very least, an economy of vocabulary. If you assume that mean's he’s an idiot, then the range of possible stories and character development becomes pretty narrow. But once you realize he's sharp and dangerous and full of hidden emotional needs and desires of his own, he becomes an incredibly rich character to explore. Comixfan: For those who don't know, "Planet Hulk" takes the Hulk out of his traditional element and into what seems to be a rich fantasy-oriented setting. What was the impetus behind the move? Pak: I wasn’t in the room when the idea first germinated. But as I understand it, [Editor-in-Chief] Joe Quesada and the other Marvel editors saw that it was time for the Hulk to cut loose, to run wild -— essentially, to be the Hulk. And a savage alien planet seemed like the perfect place to stage that kind of story. 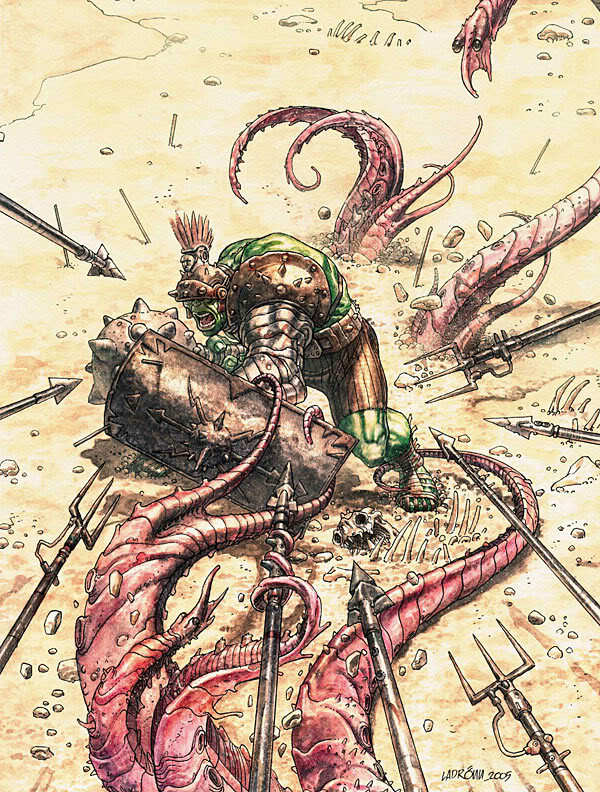 Comixfan: Without giving too much of the innards of the saga away, how much of the concept for Planet Hulk was given to you and how much was your own invention? Was it an "event" before or after you became involved? Were you given a beginning and end point? Pak: The editors gave me the set up and a few key plot points, big brush ideas which made me grin--they totally fit in with the kind of Hulk story I'd been itching to tell. My job has been to flesh out the plot, develop the Hulk's emotional story, invent the political, social, and ecological background of the planet and its inhabitants, create the supporting cast, and work out the character arcs and subplots and subtext. Editor Mark Paniccia has been a great collaborator and interior artist Carlo Pagulayan and cover artist Ladronn have been brilliantly creating designs for the characters and planet which bring my loopy concepts to life while always inspiring new ideas. Comixfan: How was the decision made to use Carlo Pagulayan as an artist? Was he your choice, the editor's, or someone else's? Pak: Mark Paniccia had worked with Carlo on a number of projects, including Marvel Age Fantastic Four. He showed me some art and I was sold immediately. Carlo's doing tremendous work--he's not only a great sequential artist, but a fantastic designer, bringing a fresh look to every alien, monster, and piece of hardware in the book. 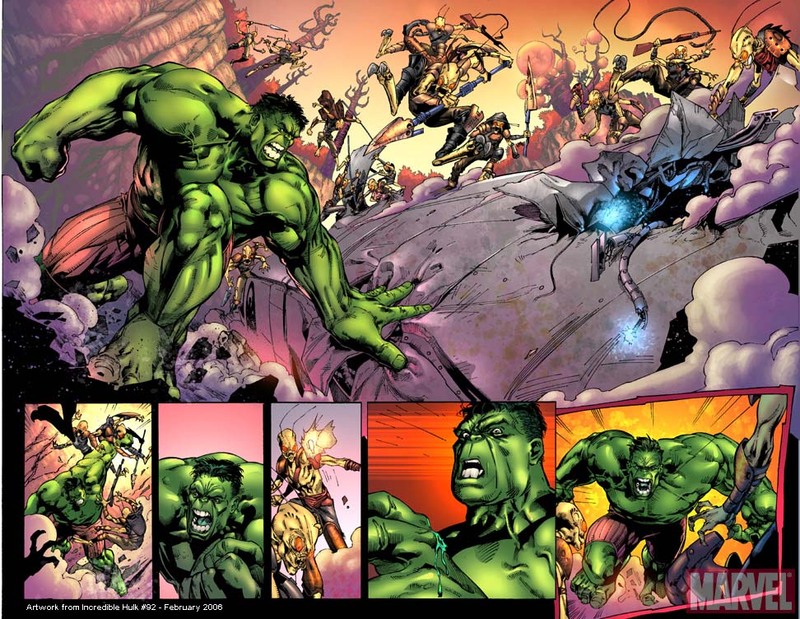 Comixfan: Tell us about the world the Hulk visits in "Planet Hulk." And how the heck does the Hulk even get to this far-out world? Pak: I can't say too much for fear of entering spoiler territory. But imagine imperial Rome with a smattering of 21st century technology. The planet is run by a corrupt empire which depends upon slavery to power its economy and gladiatorial games to placate its citizens. The empire has little advanced technology of its own, but alien ships periodically fall from a nearby cosmic portal to the planet's surface. Scavenging the alien wrecks for the past two generations has given the empire enough advanced weaponry to consolidate its power and oppress its people. But the planet is still primitive enough that a single powerful individual with the will and vision could literally change the world. Comixfan: I'll take that as a big hint. 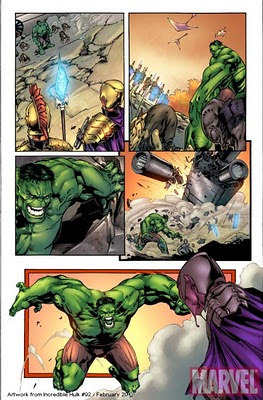 On that note, some of the previous information released for "Planet Hulk" ("In a world in which might makes right and he who wins in the arena has the chance to influence thousands, what path will the Hulk take? Will the monster become a hero? Or will he become the worst tyrant the universe has ever seen?" from the press release) seems to suggest the Hulk becoming not unlike the Maestro, his evil alternate self (from Peter David's Future Imperfect series). Any comments? Pak: My lips are sealed. Comixfan: It couldn't hurt to try. So, who are some of the new characters the Hulk meets on this new world? Do any old spacefaring favorites show up? Pak: Again, I can't say too much. But the planet will feature a number of indigenous species as well as a few key individuals from some particularly lethal Marvel Universe alien races. There's one new character in particular I'm excited about--watch for the giant woman warrior in [#92]. She's as dangerous as the Hulk himself and will play a critical role as the story unfolds. Comixfan: Longtime Hulk fans know the Hulk's been in some off-world, fantasy-type adventures before (c.f. the Jarella/K'ai sagas of the 70s, the "Crossroads" arc in the 80s, and a few other stories here and there). What separates "Planet Hulk" from those epics? Pak: I love the Jarella and Crossroads stories. And fans of those stories should get a big kick out of "Planet Hulk" -- any day you get to see the Hulk with a battle-axe is a good day, after all. And there are a few specific homages here and there which long-time readers may enjoy. 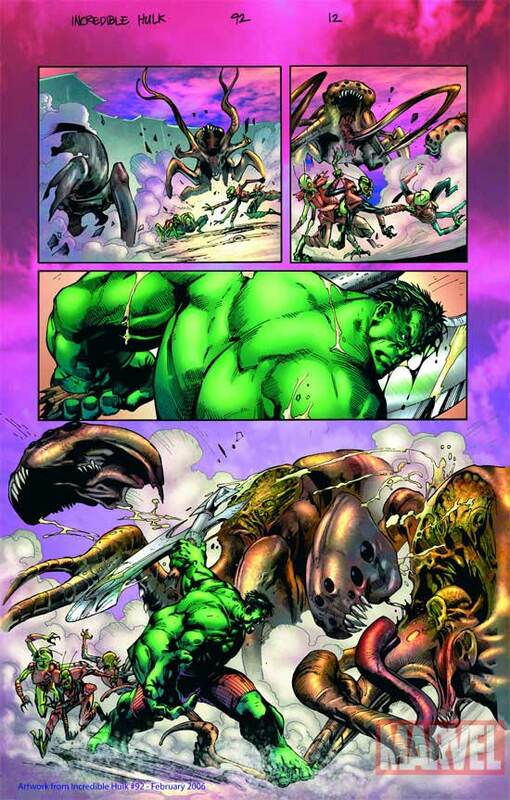 But readers should also be happy to know that "Planet Hulk" has its own unique scope, character arc, and genre twist. Regarding scope, the Jarella stories were largely episodic, a few issues here and there separated sometimes by years. The Crossroads stories, while appearing sequentially, were built like a series of fables, almost like "Twilight Zone" episodes in comic form. 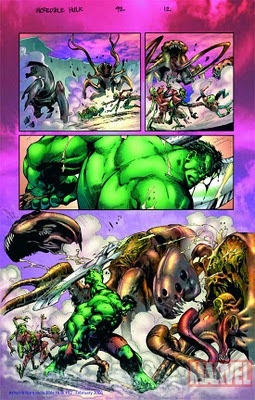 In contrast, "Planet Hulk" is an ongoing storyline which follows the Hulk and his allies and enemies over consecutive issues through a series of tumultuous decisions and events which will change each character and indeed the entire planet. We’ve been given a huge canvas to work on, which we’re doing our best to use to deliver a tale with the multi-level storytelling impact of an epic movie. Another important distinction is that the Jarella stories, the Crossroads stories, and "Planet Hulk" all deal with different incarnations of the Hulk, and thus each has something different to offer in the exploration and development of the Hulk character and mythos. 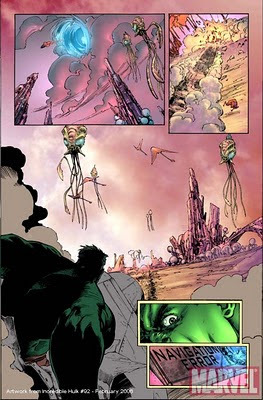 In most of his appearances on Jarella's world, the Hulk was subjected to sorcery which put Banner's brain in control of the Hulk's body--the initial idea seemed to be to explore the notion of fulfilling Banner's deepest dream, of having his own brain in the body of the Hulk in a world in which the Hulk's tremendous power would make him a hero. The Crossroads stories took the other extreme, stripping the Hulk down to an animalistic, barely sentient state, exploring the question of whether an insanely powerful, animalistic child of a man could find a home in any world. In "Planet Hulk," we’re working with a savage but crafty Hulk. Again, the question is whether the Hulk can ever find a place where he can belong. But we have the good fortune to be able explore the question on an entirely different level, since Peter David has bequeathed us with a dramatically complex and compelling incarnation of the Hulk who can make his own decisions and who's responsible for his actions, yet who retains the savage instincts of the more animalistic incarnations of the Hulk. It's going to be a great ride with inherent tension--will our savage, crafty Hulk seize the challenges and opportunities offered in this brutal new world to become a hero... or a monster? Finally, both the Jarella and the Crossroads stories involved swords and sorcery--they're a bit more fantasy than science fiction. But "Planet Hulk" is more science fiction than fantasy--battleaxes and blasters, if you will. We're striving to create a world which makes sense biologically and scientifically as well as politically and socially. So the tone is less magical fable and more science fiction epic--it’s a visceral, tactile world in which flesh-and-blood people use politics, technology, violence, and emotion to struggle over life-and-death challenges. Comixfan: It certainly sounds like you know your Hulk history. Besides the Jarella and Crossroads stories, what Hulk storylines or single issues have you particularly enjoyed and/or define the character in your mind? Why? Pak: Peter David's Future Imperfect and Hulk: The End stories are amazing. My favorite recent Hulk story is Eric Powell's Devil Dinosaur one-shot. Beautiful art and hilarious writing. Again, very different from what we’re doing with "Planet Hulk," but a great example of the fun potential of the savage Hulk incarnation. 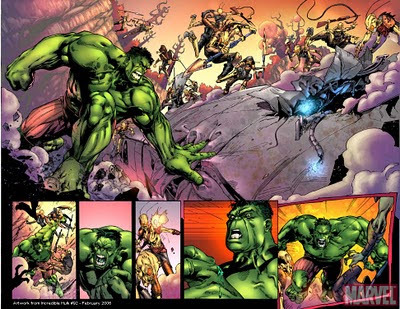 Comixfan: Speaking of incarnations...who'd you rather have your back in a fight: the current Hulk of "Planet Hulk"; the gray-skinned "Fixit" Hulk; or the ol' "Hulk Smash" version? Why? Pak: The "Planet Hulk" Hulk, of course. Although I can't tell you why just yet for fear of spoilers. Comixfan: What's been said about the storyline thus far--far-away planet, enemies as strong as the Hulk himself--it doesn't seem like there's a place for Bruce Banner. Where does the 'puny human' scientist fit in amid the chaos? Comixfan: Okay, now I know something is up when you issue a denial about Banner. Very interesting. I'll up the ante again: if the Hulk action takes place on another planet, then the obvious question is, how does the storyline have repercussions throughout the entire Marvel Universe, as has been promised? Pak: All I’ll say is listen to what Joe [Quesada]’s been saying. It’ll be big. Comixfan: How long is "Planet Hulk" set to run? Are you planning on staying around after the storyline wraps? Pak: It's at least an eight issue arc. And I'm ready to stick around as long as they'll have me. Comixfan: Good plan. Let's start to close this puppy out, and discuss some generalities. Who are your writing influences? Pak: It's tough to say what's influencing me at any given moment. But a few of the fiction writers I've always loved include Ray Bradbury, Kurt Vonnegut, and William Faulkner. In film, you can't beat Akira Kurosawa and Billy Wilder. My all time favorite comics include Miller’s Daredevil: Born Again, Batman: Year One, and Dark Knight Returns; Miyazaki’s Nausicaa of the Valley of Wind; and Windsor-Smith’s Weapon X. Oh, yeah, and “Peanuts.” Bendis's New Avengers, Vaughan’s Runaways, Slott's Spider-Man/Human Torch, and Hotta’s Hikaru No Go are probably my favorite recent comics. Comixfan: Nice...a wide variety. Besides Hulk, what other projects do you have in development? Pak: I have a few very exciting comics projects coming up, but nothing I can talk about publicly yet. I’ve also recently completed two new short films, which should be hitting film festivals over the next few months. More news, as always, at www.gregpak.com. 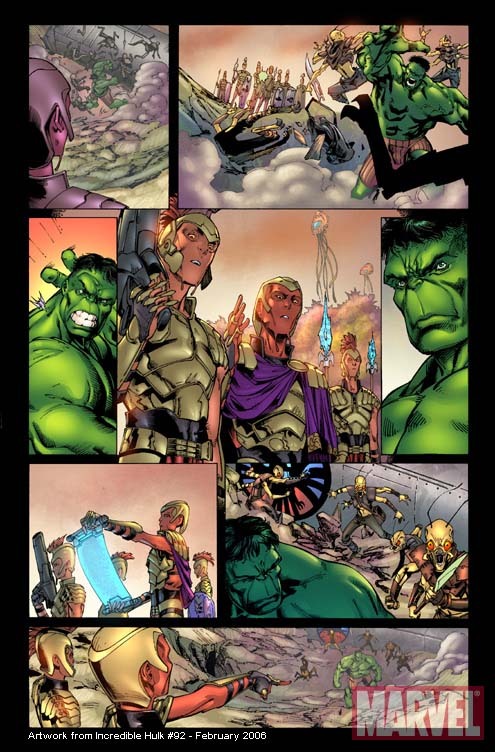 Comixfan: We've glimpsed your view of Hulks past and the tip of the story iceberg for "Planet Hulk." In summation, what do you hope to bring to the Hulk that is unique from what other writers have brought to the table? Pak: I’m just trying to tell the best darn Hulk stories I can. The rest is up for readers to judge. Comixfan: And that's about as good a point to end on as any. Thanks for the interview, Greg, and all the best! Incredible Hulk #92 hits shelves February 8th. What a coincidence that this is posted today. I've never read Planet Hulk, but suddenly got the urge to finally check it out, so I ordered the hardcover collection on Amazon last today. Today is the day it was estimated to be delivered, but it hasn't arrived yet. J.R., I hope you enjoy "Planet Hulk"! Beware the hardcover collection (at least the printing that I own) had dialogue from #104 transposed into one of the early pages of #105. It's fixed in the softcover edition. If you need the fixed page, I'll see what I can do. Stay tuned for more archived interviews with Greg Pak, including one on "World War Hulk," as well as, closer to "Heart of the Monster"....awww, but that'd be telling! Thanks for the head's up. It's a used copy that I ordered, so it's likely to have that error. One interesting thing is that Pak says the story was going to be at least 8 issues when it was a bit longer. Does anyone know anything when or why the chose the length they did?